We chose to put these videos on a DATA DVD. It MUST be played on a computer. It will not play in a conventional DVD player hooked up to a TV. The reason we chose this route is because at just over 5.5 hours in length, it would require 3 DVDs to fit it all. Click on the Meyer part number below for ordering info. 5 15870 15870 1 Relief Valve Assy. 11* 15131 15131 1 O-Ring 3-1/2 I.D. 12* 15163 15163 1 O-Ring 1-15/16 I.D. 13* 15198 15198 1 O-Ring 1-1/8 I.D. 14 15738 15738 1 Cover & Seal Assy. 16* 15131 15131 1 O-Ring 3-1/2 I.D. 32 15641 15641 1 Filter Kit - 9/16"
34 21999 21999 1 Plug w/O-Ring - 9/16"
39* 15124 15124 1 O-Ring 3/8 I.D. 43* 15122 15122 3 O-Ring 1/4 I.D. 44 21999 21999 2 Drain Plug w/O-Ring - 9/16"
45* 15127 15127 1 O-Ring 5/8 I.D. Parts in grey are included in assembly under which they are grey. 62 15126 15126 1 O-ring 9/16 I.D. 89 21826 21826 4 Soc. Head 5/16-18 x 1-1/2"
91 21859 21859 4 Soc. Head 5/16-18 x 3/4"
Parts indented are included in assembly in bold type under which they are highlighted grey. 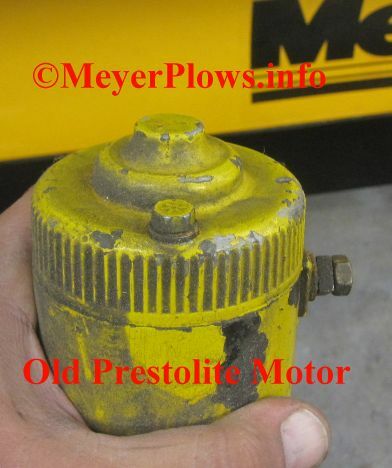 Click on the above picture for more info on the old Prestolite Motors. Kit contains O Ring Kits for Meyer E=47, E-57, and E-60 pump solenoid Valves. Includes O Rings for the A, B, C, and Crossover Relief Valve. E-47 Name Plate Badge Decal for Meyer E-47 Electrolift Units. GENUINE MEYER DECAL. E-57 Decal for Meyer plow pumps. Genuine Meyer has perforation on bottom where serial number is usually printed. New motor cap for Bosch type motors found on most Meyer E-46 and E-47 snow plow pumps. *DOES NOT FIT PRESTOLITE MOTORS! 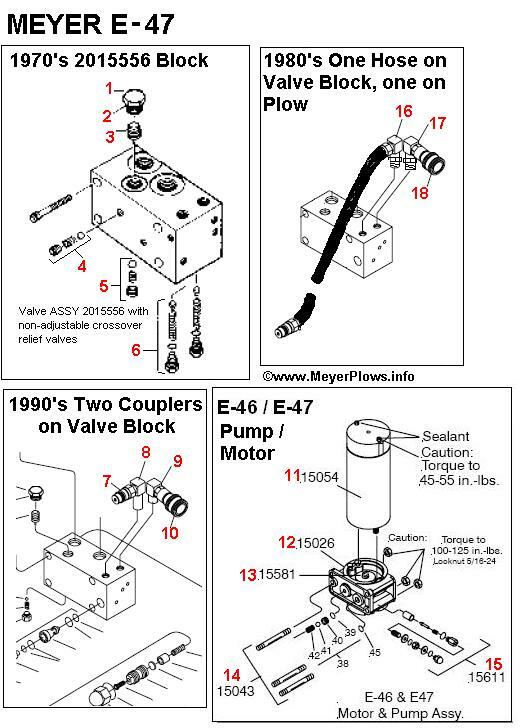 This is a Hardware Kit for Meyer E-47 pumps. 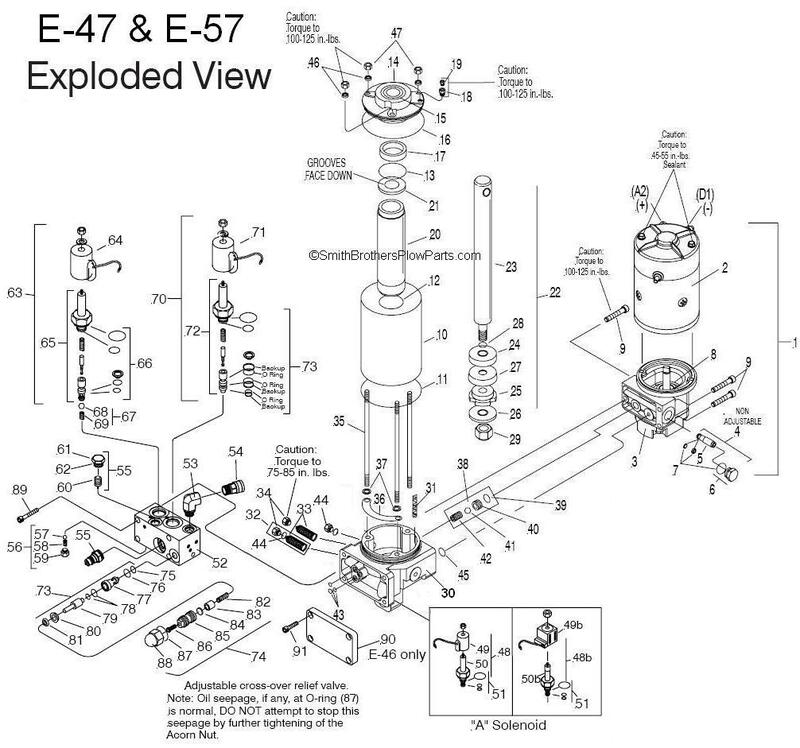 This kit includes all the fasteners we replace when rebuilding ALL E-47's in our shop.